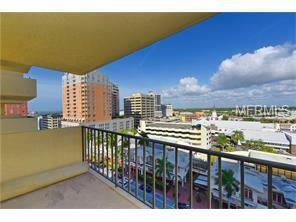 Fabulous views of Downtown Sarasota from this 10th floor unit in Dolphin Tower located in the heart of Downtown Sarasota. Sarasota Bay views from your private balcony! Imagine being within close proximity to all of the finest restaurants downtown Sarasota has to offer. Enjoy a wonderful performance at a local theatre, gaze at Florida's famed sunset while sitting at a waterfront park, or relish the unforgettable evening over a night cap at a classy establishment while never getting into your vehicle. The building is currently being renovated w/ a beautiful new lobby and hallway renovations. Washer and dryer hookups will be added as well! Great location on Gulfstream Avenue with direct access to Palm Avenue and just steps to the beautiful bay front with all that the city has to offer. Don't miss out on this gorgeous unit that would be perfect for an investment property or even call it home.